My Published Book: "The Women We Become"
"There's a warm breeze wafting in my bedroom window, bringing with it the smell of jasmine: a perfect beginning for this day. In the bathroom, I splash water on my face and happen to look up into the mirror. Looking back at me with an intensity that I could feel reflected in my own face is the face of an old woman." "To be seen as an old woman is to risk being seen as a crone or a hag, Ann Thomas claims in 'The Women We Become.' Nowadays, these titles serve as insults, she says, contributing to the oppression and self-loathing that aging women have felt for generations. By returning to the framework of ancient folklore and mythology (when hag and crone implied status and power), Thomas helps women re-examine the contemporary aging process. Although this is a grounded discussion of growing old, the gifted storytelling and rich imagery (such as snow maidens, lichen trees, snakes, and spindles) breathe solace and inspiration into the hearts of older women." 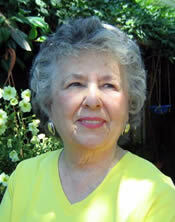 Ann G. Thomas, EdD, is an innovator and leader in the area of journeying mindfully into the elder years. She has worked with women, both as a psychotherapist and as an educator/group leader to help them gain and perfect the skills and tools they need in order to embrace this journey. Dr. Thomas' own personal journey began first in the South where she graduated from high school in Atlanta, Georgia, before migrating north to earn her BA in English from Western Reserve University in Cleveland, Ohio. While this educational background would eventually prove useful, it wasn't immediately popular in the market place. She moved to the northeast and went on to earn three advanced degrees. Along the way she had two children, each of whom she is still willing to rave about to any person who will listen, although her two grandchildren seem every bit as brilliant and charming as she remembers her children to have been at the same age. In addition, Dr. Thomas has owned a home for the frail elderly, served on the boards of several agencies providing services to the elderly, owned and directed a consulting firm that provided services to communities and organizations, and has maintained a private practice as a psychotherapist since 1969. She has lectured nationally and internationally to audiences ranging from church groups, college students, business men and women contemplating early retirement, chiropractors, psychologists and medical doctors who treat the elderly, and general audiences interested in their own aging process. As a storyteller she has entertained and enlightened audiences ranging from retirement communities to passengers on a cruise ship. It is this wide variety of experiences that Dr. Thomas brings to her writing, whether it is a children's story, a magazine article, a romance, a short story, or her most recent non-fiction release, "The Women We Become." ​She is currently living and working in California.